Established in 2012, today’s holiday raises awareness of the advances in educational technology for classrooms and teachers and to spread opportunities to schools and communities across the country for all youth to use. Digital Learning Day also highlights innovative educators who are using technology to enhance their lessons and bring the latest information and learning tools to students from kindergarten through high school. For more information on today’s holiday and to find resources for using technology in the classroom visit the Digital Learning Day website. As Grace Hopper finished writing a computer code to guide Navy missiles, she noticed that there was a certain string of code that she had repeated many times. “Grace snorted. What a colossal waste of time! There had to be a better way. Why not make the computer do the work?” Grace figured out a way for the computer to store pieces of a program and then find them again to create another program. Grace was the first computer programmer to do this. Image copyright Katy Wu, 2017, text copyright Laurie Wallmark, 2017. Courtesy of Sterling Children’s Books. Studying hard, Grace finished high school two years early, and while she had the grades in math and science to go to college, she failed Latin. Without passing Latin, she couldn’t go to college. Grace buckled down and the next year she was off to Vassar College. Grace passed up taking classes such as “Husbands and Wives” and “Motherhood” to take math and physics. But Grace did a lot more than just study. “Her personal motto was ‘Dare and Do,’ and she took it to heart. She flew in a barnstormer airplane. Then one day Grace learned that “the new computer, the Mark II, had stopped working.” Grace and her coworkers searched and searched for an error in the code, but they found none. Then Grace thought that maybe the problem wasn’t in the code but in the computer itself. They looked inside the huge machine for loose wires or electrical shorts. Nothing. Then they saw it—a moth had gotten inside and was blocking a switch. With a tweezer, a worker removed the moth and the computer started up again. Grace taped the moth into the log book and wrote, “‘First actual case of [a computer] bug being found,’” and the term “computer bug” was born. Grace also revolutionized programming when she “invented a program that let people use words to tell the computer what to do” instead of pages and pages of 1s and 0s. A timeline of Grace Hopper’s life as well as a list of honors awarded her and resources for further reading about Grace and other women in STEM. Laurie Wallmark’s engaging biography of Grace Hopper will delight kids as they see her grow from a precocious and innovative child to a woman who used her intelligence and imagination to lead the computer revolution. Specific examples of Grace’s successes and the support she received at home will encourage other engineering-minded kids, and the inclusion of her failure in Latin demonstrates that everyone has areas of weakness that can be overcome with hard work. Grace’s perseverance in getting the Navy to accept her is also a good lesson for children on not giving up on their dreams. The provenance of the term “computer bug” will surprise and amuse readers. Katy Wu’s charming illustrations of events in Grace Hopper’s life take readers back to time when computers were new. Children will marvel over the size and design of early computers. Grace’s sense of adventure and humor are on display is colorful and action-packed images. Uplifting and encouraging sayings by Grace Hopper that will inspire children are sprinkled throughout the pages. A book to motivate children to reach for their dreams and spark pride in individual accomplishment, Grace Hopper: Queen of Computer Code would be an influential book to add to home, school, and public libraries. Discover more about Laurie Wallmark and her books on her website. To learn more about Katy Wu, her books, and her art on Tumblr. Digital communication has a language all its own! 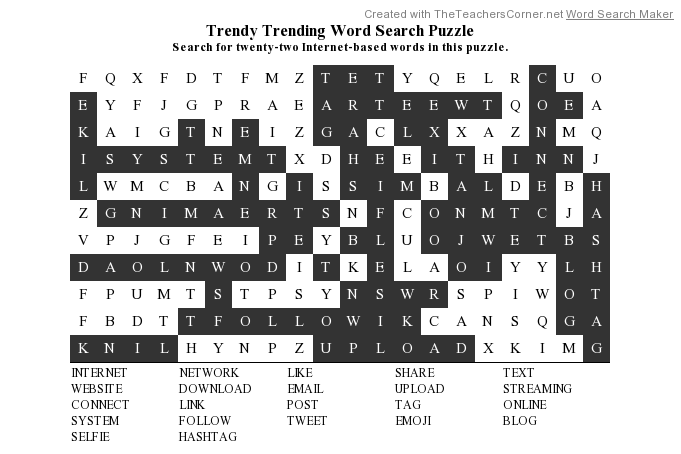 Open this laptop and find the twenty-two Internet-based words in this printable word search puzzle. Is there any better way to spend a summer day than playing on a sandy beach? That wet, compact surface is perfect for running on, digging in, and of course building sandcastles with. And the soft, dry areas? Their great for setting up chairs or blankets and wiggling toes in. Whether you head out to the ocean, a lake, or even a secluded river bank, don’t forget to pack a pail and shovel for some family fun! It’s the last day of Pearl’s summer vacation, and she’s hit the beach with her parents. Her goal is to build a sandcastle. It’s not like she hasn’t tried on other beach days, but there was always something that destroyed it. There was the frisbee that landed on top of it, then a surfer glided right into it, and another girl’s dog, Ada Puglace, thought it needed a moat. But today, Pearl brought her robot, Pascal, to build her sandcastle. Image copyright Sara Palacios, 2018, text copyright Josh Funk, 2018. Courtesy of Viking Books for Young Readers. As Pearl explains, “He’ll do whatever I tell him—as long as I tell him in code. It’s not a secret code—it’s special instructions that computers understand.” Pearl points out the perfect spot on the beach for her sandcastle and tells Pascal to build it. But Pascal doesn’t move. Pearl realizes that she must break down the one big request into smaller problems for Pascal to solve. Easy-Peasy, Pearl thinks. The first problem Pearl gives Pascal is: “find a place to build.” First Pascal travels out to sea, but Pearl tells him they must build on land. So Pascal rolls out into the parking lot. Hmmm…that’s not right either. Pearl decides she must be “very specific with my instructions.” When she tells Pascal to “find a flat spot on sand that isn’t too close to the water,” he marks an X on a perfect sandy spot. Great! The second problem Pearl gives Pascal is to “gather up sand.” She’s learned to be very particular in her instructions, so she gives her robot a three-step process: “Fill the pail with sand, dump the sand on our spot, pat the sand down.” This works just right, so Pearl continues telling Pascal the directions, until she grows tired of speaking. There must be a better way, Pearl thinks. How about a loop? Pearl directs Pascal to “loop through this sequence,” and just like that Pascal is off and rolling and Pearl gets to relax. A while later, Pearl discovers that Pascal had built a pyramid-high pile of sand, so Pearl tells him to stop. Next, they will “shape and decorate the castle.” Pearl comes back with pretty seashells to add to the castle, while Pascal brings back the lifeguard—in his chair. Pearl orders Pascal to bring back something smaller. When he comes back with a crab, she tells him it must be something that doesn’t move, and when he shows up with a baby’s pacifier, Pearl knows she must do a better job of explaining. She decides to give him “if—then—else” instructions. With these detailed directions, Pascal returns with a shell and some seaweed. Finally, it’s time to shape the castle. They use their buckets and hands to build a beautiful castle that even has a turret. The shells, rocks, and seaweed are the perfect finishing touches. With the castle finally finished, Pearl runs off to get her toys. But when she gets back, Pearl discovers that the rising tide has washed their sandcastle out to sea. And to make matters worse, Ada Puglace is back to add another moat. Hmmm… a moat? Pearl thinks. That’s what she needed the first time. Pearl really wants to rebuild, but it took her half a day to make the first one. Then she realizes that the code is already written. All she has to do is use it again. In no time a new sandcastle stands gleaming on the beach. A Foreward written by Reshma Saujani, the founder of Girls Who Code, introduces readers to this organization that is “working to close the gender gap in technology” and get girls of all ages excited about coding and future opportunities in science and technology. Pearl and Pascal’s Guide to Coding with brief discussions of Code, Sequence, Loops, and If-Then-Else follows the text. With his infectious enthusiasm and talent to reach kids in new and innovative ways, Josh Funk, a computer programmer by day and super writer by night, is a perfect guide to the joys of coding for young learners. Taking kids out to the beach for a bit of sandcastle building—an endeavor that is often fraught with dangers—is a terrific way to show the procedures and power of coding. Pearl’s initial missteps in programming Pascal provide laugh-out-loud moments while also demonstrating that computer programs work with precise instructions. Her inexperience but quick learning will give readers confidence in their own abilities to code and where to look for problems if their program does not run as smoothly as they’d like. When high tide washes Pearl and Pascal’s sandcastle out to sea, readers may groan in empathy, but the opportunity to do it all again—only bigger and better—will make them cheer. Sara Palacios’s golden beach is a wide-open and inviting platform to introduce the world of computer programming to young readers. Sunny and enthusiastic, Pearl, in her heart-shaped sunglasses, is persistent and smart in figuring out just how to make Pascal do what she wants. Pascal is a round, rolling cutie, perpetually happy to perform its duties. Series of panels and speech bubbles depict each instruction Pearl gives Pascal, clearly showing readers how coding and a computer’s response to its instructions work. Sequence loops are cleverly portrayed with typeface that creates a circle around Pearl’s floating ring and later around the trench that will surround the castle and become the moat. The final image of Pearl and Pascal celebrating their successful day together is powerful encouragement that a new day of girls and women in technology and science is on the horizon. Coding a Sandcastle is a motivating combination of lighthearted fun and accessible education that will encourage girls—and boys—to get involved with computer coding just for their own enjoyment or as a future profession. It’s a must for school media and computer class libraries, and with this book on home bookshelves, kids won’t want to just play on the computer—they’ll be asking to program too. Discover more about Josh Funk and his books and find lots of fun activities to do too on his website. 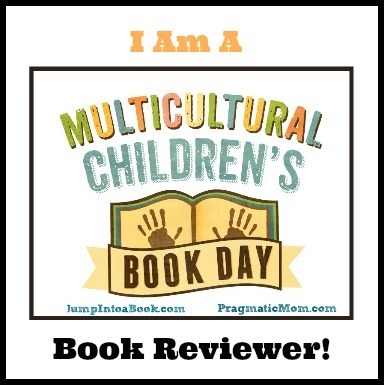 To learn more about Sara Palacios, her books, and her art, visit her website. A trip to the beach or park isn’t complete without a pail to collect shells, seaweed, sea glass, pebbles, sticks, nuts, or other things in. But why should all the cool stuff be on the inside? With this craft you can decorate your pail to show your unique personality! Today’s holiday celebrates July 20, 1969, the day when astronauts first walked on the moon. Six hours after landing on the moon with his fellow astronauts, Neil Armstrong climbed down the ladder and stepped onto the moon’s surface. Watched by millions of people on TV, this monumental human achievement ushered in the technical advancements we enjoy today. To celebrate, why not share that historic moment with your child and read up on the people who helped make that mission possible—like the subject of today’s book! Image copyright Lucy Knisley, 2017, text copyright Dean Robbins, 2017. Courtesy of Knopf Books for Young Readers. From her father who was a poet and philosopher, Margaret learned about the universe. She wanted to know “how the planets moved, when the galaxies formed, and why the stars shone.” She loved to gaze “at the night sky in wonder.” She especially wanted to know more about the moon—how far away is it? How many miles is its orbit around the Earth? What is its diameter? In school, Margaret found it fun to solve “harder and harder math problems” in algebra, geometry, and calculus. “And then she discovered computers!” She realized that she could use computers to solve so many of her questions about the universe. She began writing code and called herself a software engineer. After starting with simple mathematical problems, Margaret moved on to writing code that “could track airplanes through the clouds,” predict the weather, and perform functions they never had before. She was instrumental in helping Apollo 8 orbit the moon, Apollo 9 hook up with another ship in space, and Apollo 10 come “within nine miles of the moon’s surface.” When NASA was ready to land people on the moon, Margaret wrote the code. She thought of every problem that could arise and included a solution. The printout of her code stood taller than she was. On the day of Apollo 11’s launch, Margaret was in the control room while the world watched on television. It took four days for the spacecraft to reach the moon. Finally, the lunar module, Eagle, separated and was ready to make the landing. But just as it was about to descend, an astronaut flipped a switch that sent the Eagle’s computer into overload. An Author’s Note with more information about and photographs of Margaret Hamilton follow the text. With excellent examples from Margaret Hamilton’s childhood and adult life, Dean Robbins presents an accessible and compelling biography that reveals, from the beginning, Margaret’s curiosity, confidence, and convictions. Robbin’s focus on Margaret’s hard work, her excitement at discovering computers, and her leadership at NASA creates a narrative that is inspirational for all children. His emphasis on positive, affirming events in Margaret’s life is welcome, allowing girls and boys to realize that through dedication and self-assurance, they can achieve their goals just as Margaret—a superb role model—did. Lucy Knisley’s bright, supportive illustrations, full of thought bubbles of Margaret’s ideas and wonderings, give readers the kinds of details that will spark their imaginations and help them understand and appreciate Margaret Hamilton’s many gifts and expertise. Images of mathematical problems give way to lines of code, helping children see the connection between what they’re learning at school and future careers. Kids interested in space exploration will be enthralled with the illustrations of the NASA control room and lunar launches. For kids interested in computer science and other sciences, biographies, and history, Margaret and the Moon is an excellent addition to home as well as classroom and school libraries. Discover more about Dean Robbins and his books on his website. To learn more about Lucy Knisley, her artwork, books, and comic, visit her website. You can launch your own Tic-Tac-Toe Game with this set you make yourself! With just a couple of egg cartons, some crayons, and a printable game board, you’ll be off to the moon for some fun! Opposing players can be designated by rockets and capsules. Each player will need 5 playing pieces. 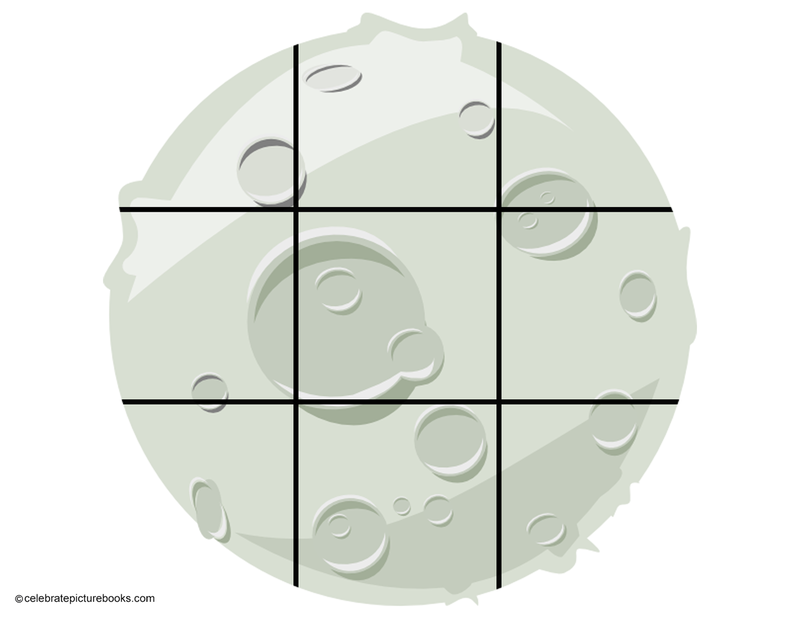 Print the Moon Game Board and play! Computer Science Education Week was launched in 2009 to raise awareness of the importance of computer coding in all careers and to invite people to learn how to code. Students from kindergarten to grade 12 are especially encouraged to take an interest in computer science and learn coding skills and also to take part in Hour of Code programs at school and elsewhere. The holiday is celebrated in December to honor computing pioneer Admiral Grace Murray Hopper, who was born December 9, 1906 and went on to become a United States Navy rear admiral. Her work with machine-independent programming languages led to the development of COBOL, and she was instrumental in many other early computer-related advancements. To celebrate this week, check out Hour of Code and try coding for yourself! Learning to code is awesome! 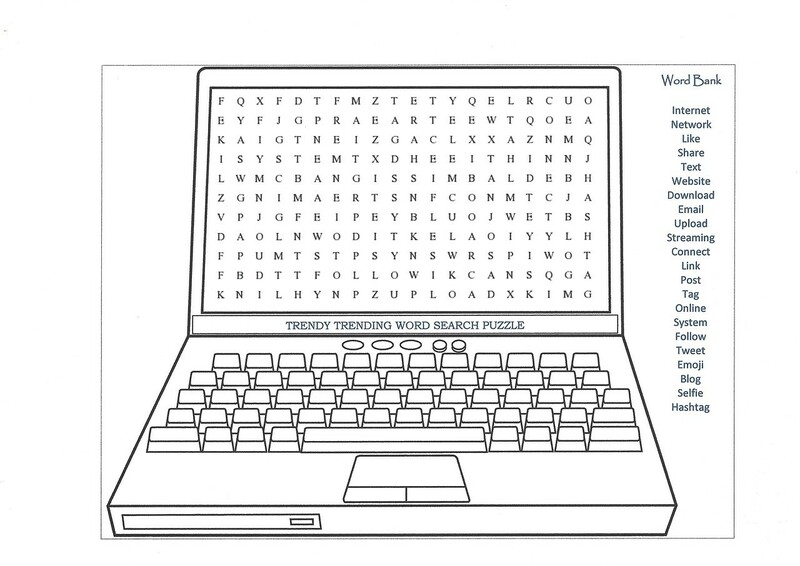 Why not try an Hour of Code here and then color this printable I Love Computers! Coloring Page!